« Happy Thankgiving from Working Well Massage! 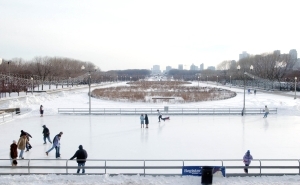 Grab Your Ice Skates Chicago, the City Rinks Are Open This November! In Chicago, we don’t need to wait for the first snowfall to get our skate on! 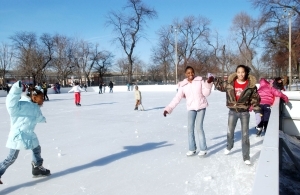 There are at least two well-known out-door ice skating rinks that are now open for Chicago children and adults this winter. The Rink at Millennium Park and the rink at Wrigley Field. List compiled from Chicago Park District site and Explore Chicago. 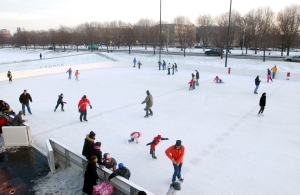 The Rink in Millennium Park will opened Friday, November 18, 2011 and will remain open through Sunday, March 11, 2012. Skate rental is available for $10. 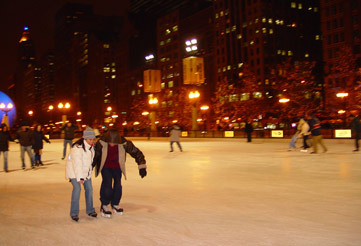 The ice rink is located on Michigan Avenue between Washington and Madison streets. Ice Skating at WRIGLEY FIELD! For the third consecutive year, an ice skating rink will welcome skaters to the Friendly Confines of Wrigley Field this winter, thanks to the generosity of the Ricketts family and the Chicago Cubs, 44th Ward Ald. Tom Tunney, the City of Chicago, the Chicago Park District, Westrec Marinas, the Central Lakeview Merchants Association, Patch Landscaping and the Lake View Citizens’ Council. Skate in the Cubs parking lot at the corner of Clark and Waveland. For more information – 312-617-7017. 1060 W. Addison St. – Addison St. and Clark St. 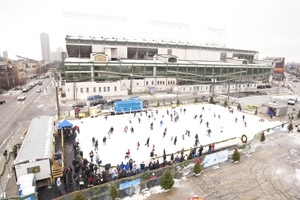 Note: Due to unusually high temperatures the Rink at Wrigley will not open until further notice. Skating was slated to be open from November 25, 2011 through February 26, 2012. Check the website for updates as temperatures cool: http://www.rinkatwrigley.com for more information. $6 skate rental; admission free. Open Skate Hours: Wednesday – Sunday, 12:30 – 7:30 p.m.
Open Skate Hours: Monday – Friday, 12 – 7 p.m., Saturday, 1 – 9 p.m.. Sunday, 12 – 7 p.m. Located at the intersection of Michigan Avenue and Washington Street between Washington and Madison Streets). Now in its tenth season, the rink is scheduled to remain open through Sunday, March 13, 2011 this year (weather permitting). Admission to the rink is free and skates are available to rent for $10. 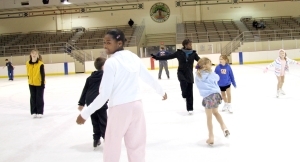 Try free ice skating and ice dancing lessons in February during Chicago Winter Dance. Skate rental is available for $10. The 16,000 square foot ice skating rink has a state-of-the-art chiller system that can maintain the ice even in the event of unseasonably warm weather. Several factors would need to be considered before the rink is closed. If you have questions about the weather, please call 312-742-5222 before you come. $3 skate rental; admission is $4 for children 12 and younger, $5 for ages 13 and older, and $2 for seniors 60 and older. All ages: Wednesday and Friday, 3:30 – 5 p.m., Saturday and Sunday, 4:30 – 6 p.m. Adults: Wednesday, 9:15 – 10:30 p.m. Teens & Adults: Friday, 9:15 – 10:45 p.m.